On this form you have all needed data for patient check-up. You can see pictures of all patient teeth. 2. To change tooth "colour/shape" click on tooth part. Each click will change tooth colour. You can click on some treatment from the treatment list. When you click on it, treatment comment is added and if treatment has assigned picture, selected tooth picture changes to treatment assigned picture. 5. Optional : If you want, choose Company/Insurance from list for current patient and enter Patient share(%), and you will see Total amount that patient should pay to you. 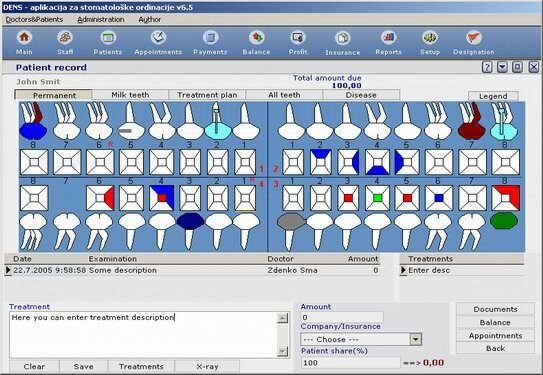 � When you select tooth, by clicking on tooth number, you will see all work that you or some other dentists have made, with dentist name and date of work. � You can select existing treatment from treatment list. Just click on 'Treatments' button and after selecting treatment from list, press 'Choose' button to return to this form, or click on short treatment list (right side of the form). �	Also you can delete already entered comment about your work. �	NOTE: You may use shortcut button if you defined it for some treatment to quickly access treatment data. �	IMPORTANT: There is a file toothColor.dj in subfolder pics where you can define number of colors that alternate changes when you click on tooth part. To return to this form click on the 'Back' button.